Interpreting year-to-year changes in annual surveys from the Census Bureau can be a tricky business, especially around decennial censuses. Because it is the largest and most comprehensive count of the population, after each new decennial census is released, the smaller but more frequently issued surveys available from the Census Bureau, such as the Current Population Survey (CPS), Housing Vacancy Survey (HVS) and American Housing Survey (AHS), are updated, or “re-benchmarked” based on the findings from the new decennial census. Prior to this, these surveys were controlled to extrapolations based off of the prior decennial census. While it is inevitable that ten years of extrapolation can lead controls to drift off course, failing to recognize when and how datasets are re-benchmarked to correct for this drift can lead to misinterpretations about short-term trends. The danger is that the re-benchmarking adjustment can be misinterpreted as an actual trend that occurred in a single month or year, rather than what it really is: a discontinuity in the data due to an adjustment made to correct the net sum of ten years of extrapolation errors that had accumulated in the dataset since the last decennial census. 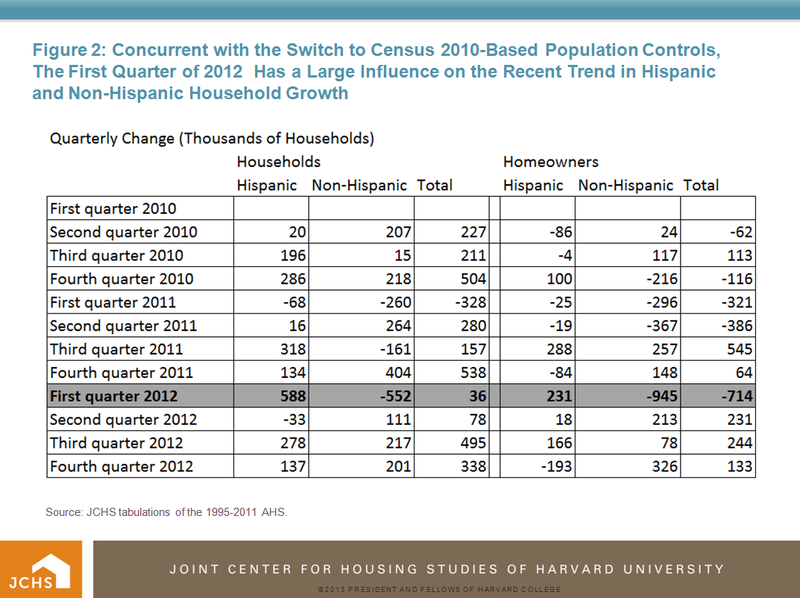 On its face, this data leads us to conclude that the number of Hispanic homeowners surged from June 2011 to June 2012, while at the same time the number of homeowners among both blacks and whites dropped significantly, and therefore without growth in Hispanic homeownership the overall number of homeowners in the US would have dropped significantly over the past 12 months instead of growing slightly as was reported. This note is important, because the distribution of occupied households by tenure, race, and ethnicity of households is based on these population controls. Therefore, any changes in the number of homeowners by race and ethnicity that spans across the first quarter of 2012 is also incorporating change due to the shift in the distribution of households by age, race, and tenure that occurred with the re-benchmarking of the survey.. 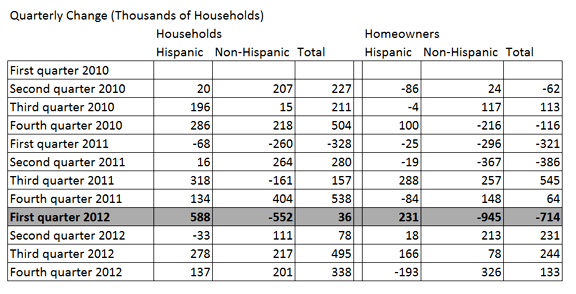 The adjustment to Hispanic households due to the re-benchmarking appears to be significant. Looking at the Hispanic share of households in HVS before and after Q1 of 2012, we can see that the re-benchmarking in that quarter led to a significant upwards adjustment that forms a discontinuity in this series (Figure 1). The existence of a discontinuity is corroborated by data from the Current Population Survey, which re-benchmarked to the 2010 Census in 2011. The CPS Table Creator allows us to see the impact of the re-benchmarking directly by comparing the Hispanic share of households in 2011 under both 2000 and 2010 Census weights. It shows that the 2010 census weights raise the Hispanic share of households a full percentage point, from 11 to 12 percent, compared to the 2000 census weights. In short, this all suggests that results from the 2010 Census found that the 2000 Census-based population extrapolations had been underestimating Hispanic household growth in the 2000s, and therefore these household counts needed to be shifted upwards in 2012 as a correction. Source: JCHS tabulations of US Census Bureau, Housing Vacancy Survey data. 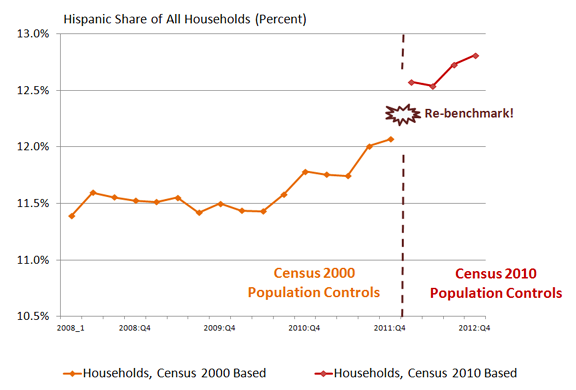 With the change in population controls in the HVS in Q1 of 2012, the amount to which the shift in the distribution of households towards Hispanic households was underestimated incrementally over the last ten years gets corrected all at once, and gets attributed as change measured between Q4 of 2011 and Q1 of 2012. And as we see in Figure 2, the quarterly change recorded in Q1 of 2012 has a huge influence over our view of the recent trend in household and homeownership growth by Hispanic ethnicity. 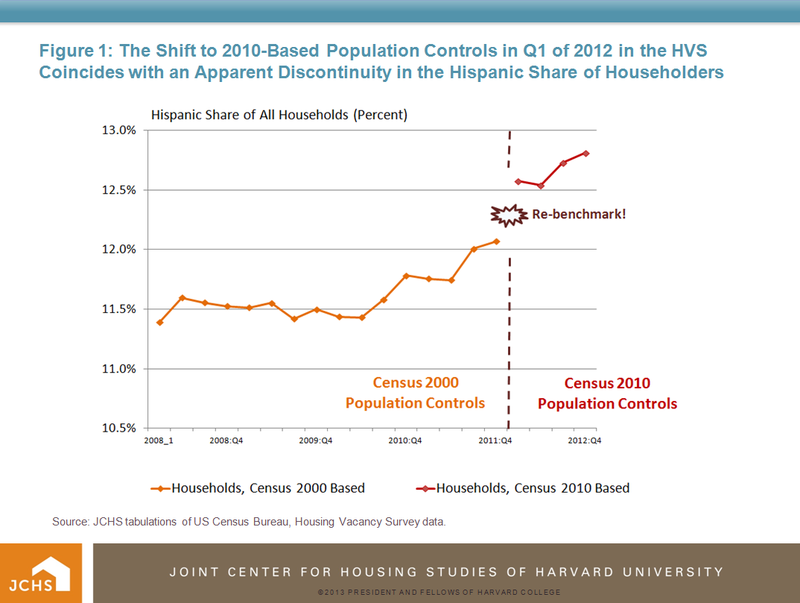 Without the ability to compare alternative HVS household counts for Q1 of 2012 under both 2000- and 2010-based population controls, it is difficult to determine exactly how much of the change in Hispanic and non-Hispanic households and homeowners in 2011 to 2012 was due to the re-benchmarking and how much was due to actual change measurable in the survey. We refrain from presenting alternative scenarios here, but because the quarter is such an outlier, most assumptions to smooth or discount that quarter of data would conclude with much lower Hispanic household and homeowner growth and much higher growth among non-Hispanics over the past year.